Lava toast, or toast baked with butter and served with cheese and a salted egg topping, is a standout dish at Den Da Cafe. VNS photo Minh Phi. Another coffee shop in HCM City? In the last few years, the coffee scene has exploded and can no longer be called “burgeoning”. It’s truly in full flower. Den Da Cafe is a Vietnamese-owned chain that already has one shop in the US. My Duyen takes a look. When a Vietnamese orders a den da at a cafe, they want an iced coffee served local style, usually with sugar. However, at Den Da Cafe in HCM City, the drink is not the only item on the menu. Tea, baked toast and desserts, as well as coffee, are presented with flair in a uniquely Vietnamese way. Opening in 2014 with a small kiosk at Vincom Centre in downtown HCM City, Den Da now has seven coffee shops in the city and one cafe in Baltimore, Maryland in the US. 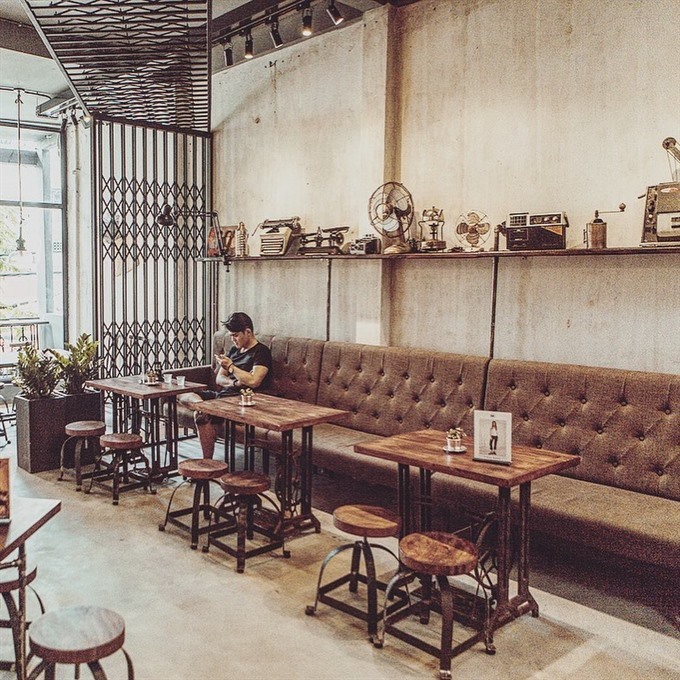 ”Den Da (literally translated as “black ice”) is a concept shop with a retro interior that reflects the spirit of Sai Gon (former name of HCM City) and its people in the last century. We’re now one of the most popular coffee, tea and dessert spots,” said Tuan Truong, the cafe’s owner and founder. 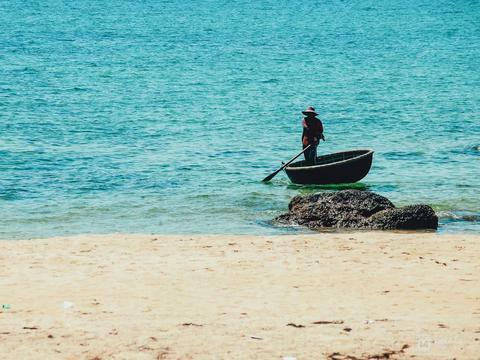 “As you know, Viet Nam is famous for its coffee and tea. 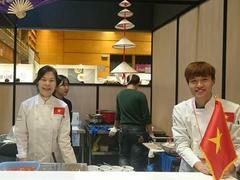 With Den Da, I want to use local quality supplies to make fine products,” he said. Tuan has brought a distinctive, charming touch to his chain. Though they share the same brand name, each cafe has a different decor but all feature images and items from the city’s past, particularly the 80s. Recently, my children and I visited the cafe on Ham Nghi Street in the centre of the city, called Den Da Cho Cu (near Cho Cu, meaning Old Market). With its logo of the traditional Vietnamese coffee filter outside the shop, I felt proud that local coffee was getting its day in the sun. Upon entering the two-storey old colonial building, we noticed the counter where orders were being taken and the stairs leading to the first floor, decorated with 19th century antiques and inspired by typical local houses. Old items on shelves, including a small TV, radio, fan, oil lamp and weight scale, evoked memories of old Sai Gon. 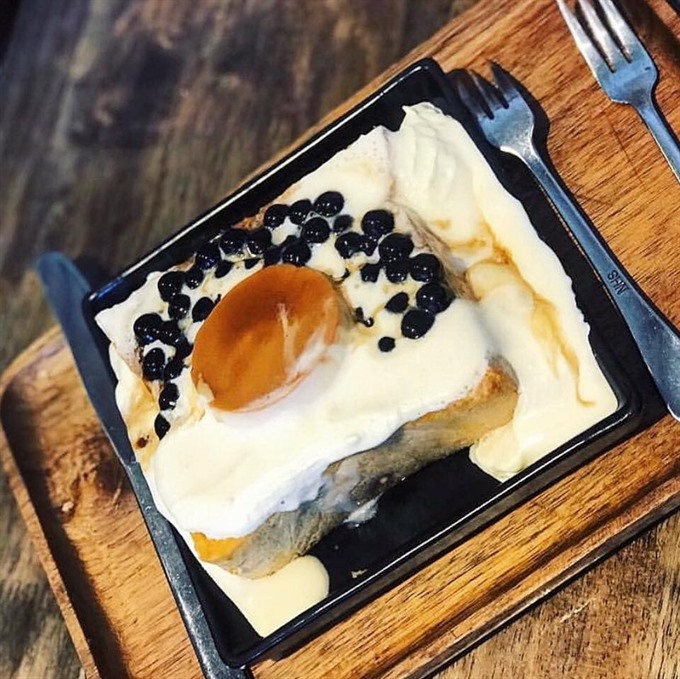 Flan caramel toast with whipped cream, caramelised flan and bubble topping is another must try at Den Da. VNS photo Minh Phi. Den Da offers authentic Vietnamese coffee with or without milk and ice using the finest ingredients. VNS photo Minh Phi. Each Den Da cafe is decorated differently but all feature images of HCM City’s past. Behind the food and beverage counter were two friendly young women who took orders and also made the drinks. Tuan told me that he had chosen the decor to “bring back the vibe of Sai Gon life in the past, and, at the same time, educate the younger generation about the unique culture of Sai Gon”. The menu offered coffee, tea, toast and dessert. Specialities, of course, included Vietnamese black coffee with or without ice, coffee with condensed milk and ice (another traditional Vietnamese drink), green tea (from the Central Highlands), and homemade toast. 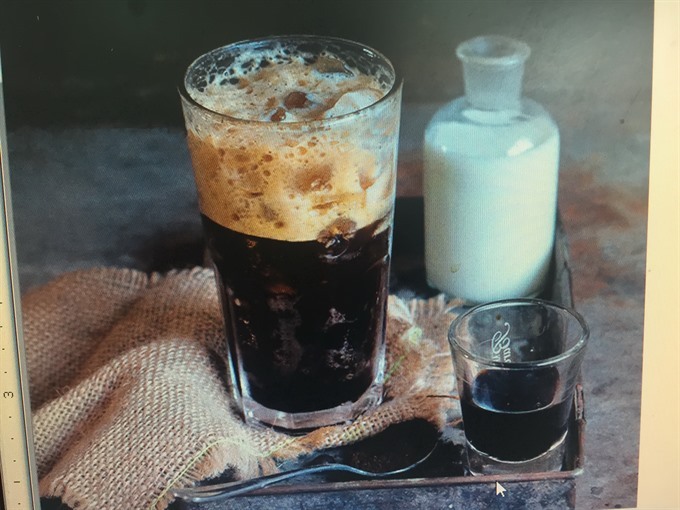 Den Da’s Vietnamese coffee maintains the tradition of using robusta beans (from Gia Lai Province), which have a stronger taste than arabica beans. Other kinds of coffee drinks, with a blend of robusta and arabica beans, are also available, including espresso, Americano, cappuccino, mocha, latte, and green-tea latte with coffee. Since I don’t drink black coffee, I ordered an ice-blended flan-pudding milk tea (VND50,000), a favourite of many customers and recommended by a young woman who was in line behind me. “Every time I visit the cafe, I usually choose a new drink,” she told me. A lover of matcha, my nine-year-old daughter asked for an ice-blended green milk tea with foam on top (VND48,000), while my son chose a cheese-foam chocolate frappe (VND50,000). We were very impressed with the presentation. My daughter said her drink was “natural and fresh”, while my son said his was “not too sweet but tasty”. After drinks were consumed, we were ready to sample the toast, so we headed downstairs to choose one of the 13 different kinds of toppings. Prices started at VND38,000. Tuan said his team had worked hard on the recipes even though toast is not a traditional Vietnamese item. 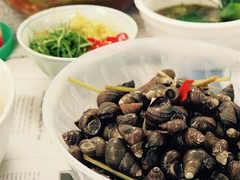 “We try to use all Vietnamese ingredients. The toast has actually made us famous,” he said. 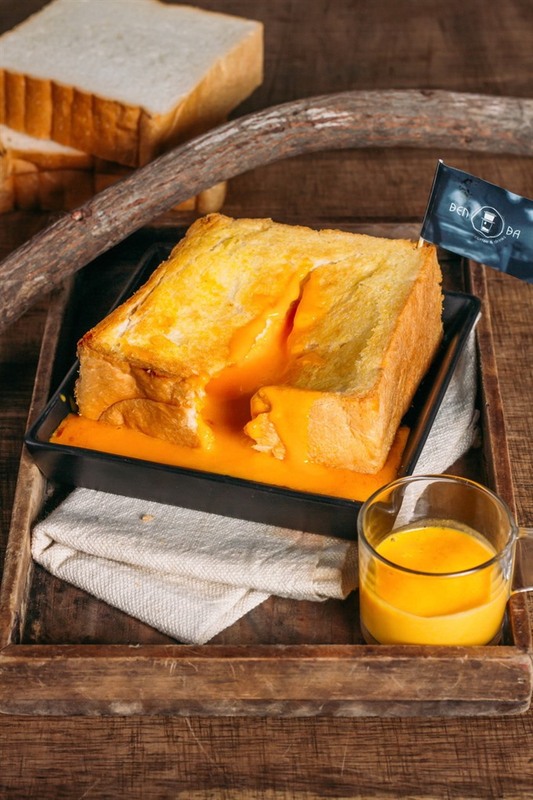 I ordered a Lava toast, which had cheese and a salted-egg sauce on top (VND63,000), for my daughter, and a toast with cheese and bubble topping (VND59,000) for my son. However, be prepared to wait. It can take up to 30 minutes to make the toast, but it’s well worth it! My daughter loved the cheese and salted egg sauce, which was colourful and richly flavourful. A young boy sitting near us said the Lava toast and flan-pudding milk tea were his favourites. For lovers of traditional sweet soups, the three-coloured sweet soup with coconut milk, and maize sweet soup with coconut milk, for VND33,000 each, should not be missed. Comment: Central location, fine Vietnamese coffee and tea, delicious toasts and desserts, cosy atmosphere. Nice spot for young diners.